Pixar has done it once again. 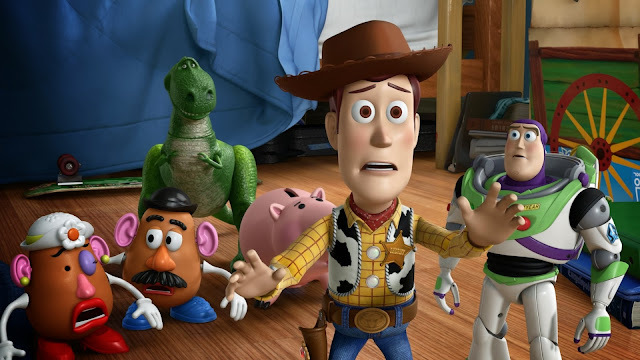 Toy Story 3, the long-delayed super sequel, is a triumph of childlike pure imagination and wonder mixed with maturity and insight as it captures a wild spirit of creativity while exploring the emotional complexity of young adulthood. Lee Unkrich, editor of the previous Toy Story films and co-director of Toy Story 2, takes over from Pixar Chief Creative Officer, John Lasseter. Toy Story 3 starts off with a bang. The opening scene is an action-packed barrage of cartoon fun that surmises how a more conventional animated feature would play out that is both fanciful and delightful. The home video sequence that bridges this entry from the previous films is both touching and effective as things age in real time, a decade later to present day. The toys' owner, Andy, is all grown up past the age of these forgotten play things. The themes, while not as artistic and subtle as in Up or WALL-E, are vivid and well delivered. Ideas of childhood wonder and imagination and that loss of creativity and spirit through adulthood are well established and skillfully executed. Loyalty, friendship, closure, letting go, and moving on are core themes artfully weaved into the picture. In a couple surprisingly mature moments, even for Pixar, characters deal with dark issues like death and acceptance. Toy Story 3 is essentially a mock prison break or escape film as the toys develop a mission to break out of Sunnyside Daycare. The writing is spot on from a script by Oscar-winning Michael Arndt (Little Miss Sunshine) and the usual brain trust of Pixar animators. Every element introduced is paid off with a moment recognizing the subtleties of ensemble filmmaking. Elements from small sequences and exposition is fully earned as the film economically uses new and old pieces of the story to execute a completely satisfying entry and logical conclusion to the Toy Story franchise. The film nature of it is well done also with moving camera shots and clever use of angles and cinematic tricks like zooms and transitions. There is a pretty great hero shot near the end and a ton of action movie scenes that are delightful and entertaining while being tense and visceral. Unkrich really establishes some true steaks for our toy heroes and creates a sense of danger and tension as we really believe the toys are in peril. The horror elements reminiscent of the first Toy Story are built upon but are even more menacing. And the musical cues and tones are solid, even if a little familiar, by Randy Newman who plays with the iconic themes of friendship through music. This is very much Woody's film (voiced by Tom Hanks) as Buzz is relegated to sidekick after their partnership was the basis for the first two films. However, Buzz has a pretty great comedic arc and Tim Allen does some fine voice work. Michael Keaton as Barbie's boyfriend and Ken doll is absolutely perfect and hilarious, stealing every scene he is in with incredible comic timing and delivery. Pixar's team also created a pretty compelling villain that reveals his true nature in interesting ways. The integration of new toys is effective and Toy Story 3 does great world building outside the confines of Andy's bedroom. The film really packs an emotional punch, especially at the end. A new human character is introduced flawlessly and with great care in a way that carries the franchise off well. The computer animation is breathtaking and has come a long way from the first Pixar film and entry in this series. Bonnie, in particular, is so well animated and formed into a cute and adorable toddler. Toy Story 3 may or may not be as good as its predecessors, but it surely lives up to that class of animation and filmmaking as an effective way to relive your childhood for at least 100 minutes or so.